Granting Power of Attorney to an agent is commonplace when you need someone to act on your behalf. 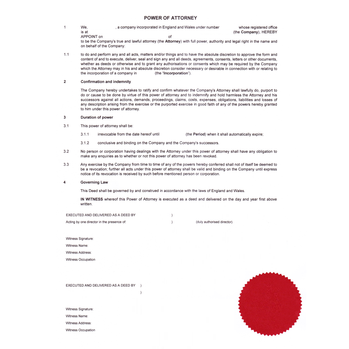 For ONLY £54 we arrange for your power of attorney to be issued with the apostille. It is standard practice for the apostille to be issued to the original document to verify the signature of the legal official who has witnessed the individual granting power of attorney. While it is possible to process a certified copy of this document it is not recommended as the document may not be accepted when this is presented overseas. Your document should be signed in the physical presence of a UK solicitor or notary public so that your signature can be witnessed. How to order an apostille for your power of attorney? Firstly, you must ensure that the individual who is granting power of attorney has signed the document in the presence of a UK solicitor or Notary Public. Following this, simply purchase your apostille online and post the original signed document to us.